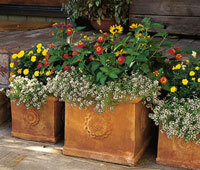 There are many different kinds of terracotta being manufactured as of this blog entry. Arizona Pottery imports from Italy, China, Indonesia & Mexico. Each type is completely different has distinctive characters. 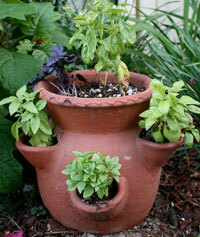 While some people collect key chains when they travel, many collect different types of clay pots. They can be seen sitting on airplanes with pieces of pottery proudly sitting in their laps. Below we will explain some of the differences and why they are desired. Italian terracotta is know in the world as the finest most beautiful clay you can purchase. It is very smooth, a lovely sun baked color and is compact and hard. This clay is still harvested from the ground and can be found all over the Italian countryside. Even though most factories are small and family owned, they produce 100% of the Italian clay pots found in the world. The styles being manufactured today are limited but the quality can't be beat. These are usually machine made so you find them consistent in size and style. The Chinese imported clay pottery is being made from a clay mix, that is form and then baked in large mud huts. This clay is very rough, porous and can be found many times with a slight white washing on the sides. Without being sealed, it will break down over time and not hold up like the Italian clay. The firing process is rather primitive so the clay is not high fired and durable. The Chinese are know for making very intricate and decorative pieces like the basket weave, braided, monogrammed and more. They have a wide variety of jars, rectangles, and hexagons. These are usually hand made. Mexican clay is very heavy, porous and will break down faster than most other terracotta products. Low fired, dark red terracotta they come in basic designs but are still know for their 3 legged pots, hose pots and chimineas. They usually are hard carved and each piece will look slightly different. You will also notice that many are sealed on the inside with a black tar product which is their way of helping to hold the clay together longer. These are usually hand made. 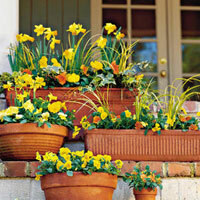 Read more.....Great gardens with potted plants. Read more.....Are you downsizing in this economy?